A blog about creating stocky photography. 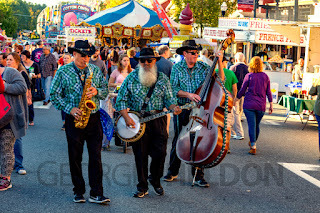 Direct from the Ephrata Fair, I managed to photograph this roving band of street musicians. The Ephrata Fair is one of my favorite venues to visit, but this was the first time I had the opportunity to photograph a band strolling through the crowd. This image is was 2018, and I hope the band returns in 2019. 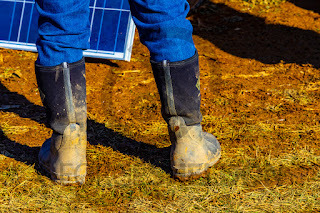 The Stock Image of the Day is a pair of muddy boots. Perhaps not the most interesting image in my collection, it is part of an editorial collection of the Gordonville Mud Sale, an annual event that benefits the local volunteer fire company and EMS in rural Lancaster County. This is one of the thousands of my images that I have available for licensed use from my representative agencies. For more information about thosee agerncies, please visit my agencies page. In this morning e-mail, notifications galore that the Olympus OM-D E-M1X Mirrorless Digital Camera has been officially released. The First Look video from B&H Photo shows the camera, which has some interesting features. Because of its price ($2,999.99) it is likely to get reviewed by the regulars on YouTube. Comments later about its suitability for stock photographers and for producing stock photography images. The Crafter Shutter discusses his income from selling stock on two agencies in January 2019.